ST. CLEER was a mining and agriculture area. 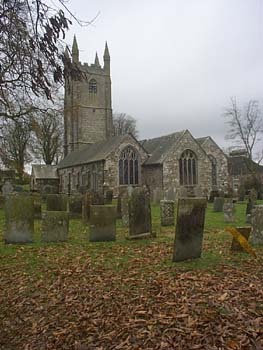 All though many of the Cornish folklores come from all over Cornwall; St. Cleer has its own. Within the parish boundaries lay ancient tombs of ‘kings and warriors’. Trevetheye Quait is a burial mound going back to 3500-2600 BC. There is the Holy Well dedicated to St. Clarus and King Doniert’s Stone, a grave marker for a Cornish King who drowned in 878 at Fowey. I have made my transcriptions available in two formats. You can either display the information sorted by surname or you can download a CSV file containing all the records to your computer and then use your spreadsheet system to look at the records. Please note that however you choose to access my transcriptions, the material is made available to you on the basis that I retain full intellectual property rights. You may use the material solely for your own personal family history research and the information may not be published, sold or otherwise distributed without my express permission. The original parish records prior to 1677 appear to have been lost but the Bishops Transcripts (an annual return that the cleric was required to make) exist for 1597-1673. Hence if you are looking for anything prior to 1597 or between 1673 & 1677 then you will not find the records here - or anywhere else! One further 'health warning' is on dates. Prior to 1752 the calendar year ran from 25th March through to 24th March so, for example, January 1750 is the month AFTER December 1750. In 1751 the days of September 2nd to 14th were cancelled and from that year onwards 31st December became the end of the calendar year. Hence from January 1752 the calendar year runs as we know it today. Note that in these transcriptions the dates are 'as recorded' i.e. as they were at the time. You'll find an explanation of the Reference Codes I have used in these transcriptions here.